Hey everyone! 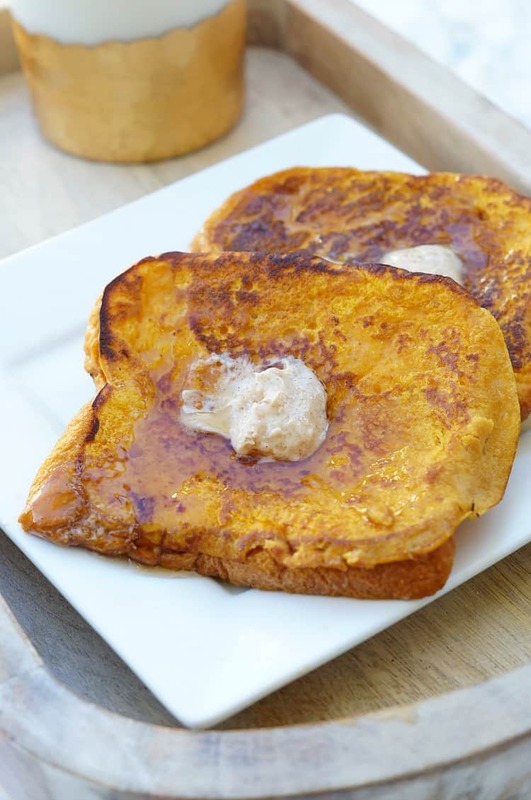 Amanda back from Old House to New Home sharing a delicious recipe for Pumpkin French Toast with Brown Sugar and Cinnamon Butter. That’s a mouthful, but the butter is so good in this recipe that it deserved a place in the title! 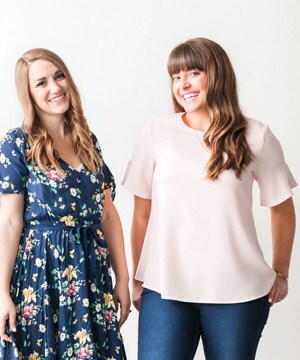 Pumpkin and apple recipes are truly king right now and I couldn’t be happier :) I absolutely love fall flavors and love incorporating them into our favorite recipes. 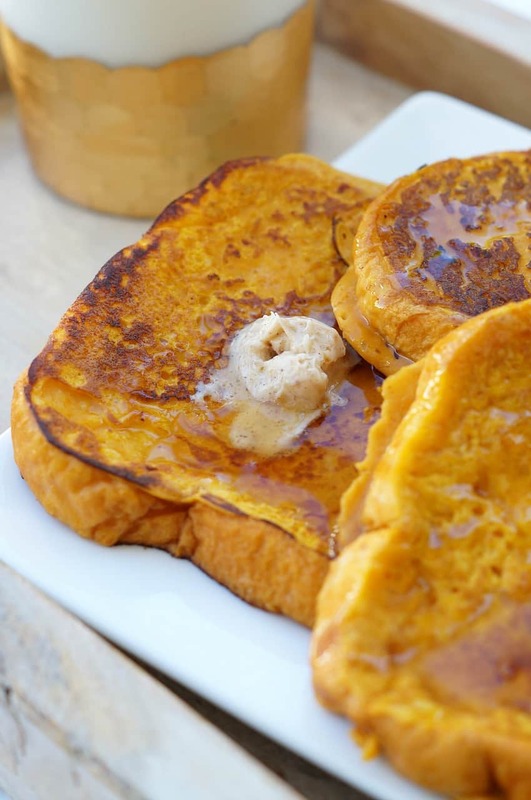 My favorite fall breakfast has always been Pumpkin Pie Pancakes, but I think this Pumpkin French Toast may be even better! I don’t often make French Toast because my husband isn’t a fan, but recently, I set out to change his mind! After some experimentation, I found two fool proof tips to make any french toast hater a new fan. My husband always complained that he didn’t like how soggy the bread got, so I set out to combat the sogginess. I replaced my normal bread with brioche in this recipe, which is so much heartier and can withstand the quick soak in the batter. You could also use challah or another hearty bread. I know some recipes recommend soaking your bread for a few minutes, but we prefer just a quick dip. The bread type makes a big difference, but the true secret tip here is…flour! Adding a couple of tablespoons of flour to the batter helps you get a nice coat on the bread, without all the sogginess! We have to dedicate a moment here to the butter. 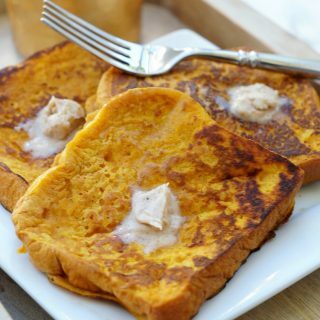 This brown sugar and cinnamon butter would make a piece of cardboard taste delicious! I have another tip here for you. 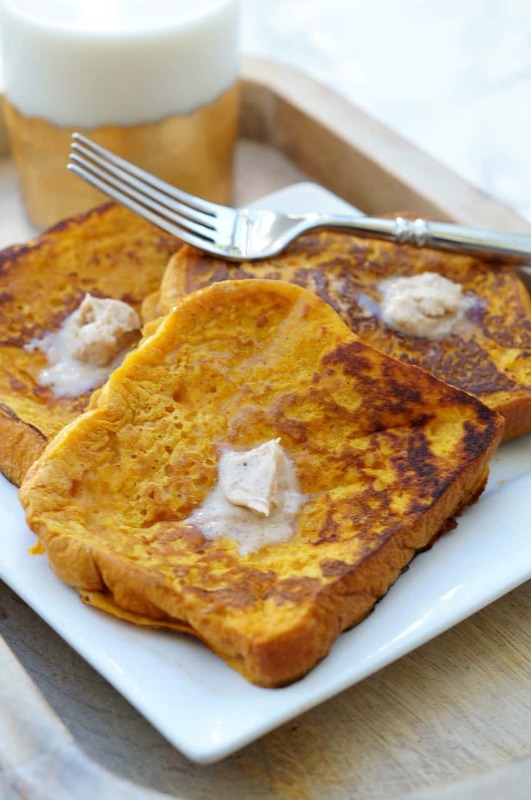 After preparing the butter, throw it in the freezer while you make the french toast. This lets it harden up a little, so when you put it on the hot french toast, it doesn’t immediately melt. Instead, it slowly soaks into the bread and lets you get a little bit of butter in each bite! 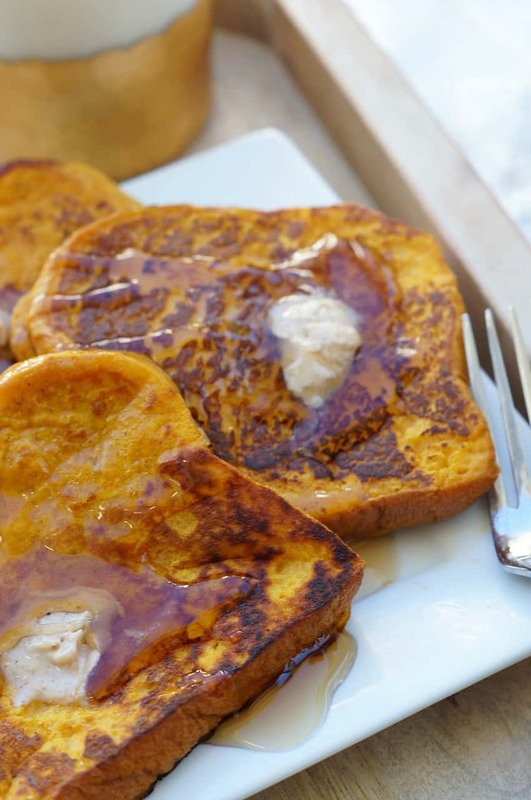 Don’t forget to drizzle on lots of maple syrup and enjoy! Add the butter, cinnamon, brown sugar, and nutmeg to a small bowl and whisk until all ingredients are incorporated. Place bowl in the freezer while you make the french toast. Preheat a skillet sprayed with cooking spray to medium high heat. In a mixing bowl, mix together eggs, milk, vanilla, and pumpkin. Whisk until well combined. In a small bowl, mix together flour, cinnamon, and brown sugar. Add dry ingredients into the wet and whisk until combined. Dip your bread into the egg mixture, coating both sides. Shake off excess. Do not let soak or you will get soggy bread. Add to hot pan and cook until golden brown, about 3-4 minutes per side. Serve immediately topped with frozen butter pieces.